Visitors to the Ghost Bar on the 55th floor of the Palms Casino Resort in Las Vegas have been reporting some unusual sightings lately. Apparently, otherworldly figures have begun to appear on the walls of the bar, ghostly sightings that, upon further investigation, don’t pose much of a mystery at all. 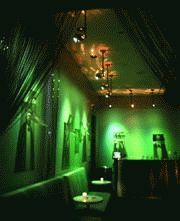 It seems the sightings occur in the Ghost Bar’s luxurious VIP room and coincide with the installation of Martin Architectural Alien 05 stem mount fixtures. Hung from the ceiling above a series of curled acrylic photographs, light from the Aliens penetrates the images, stretching the figure out onto the wall behind. The Alien fixtures (600mm stems) typically project a dreamlike blue but lighting designer Adam Wuertz, technical director for The Nine Group which operates Ghost Bar, also uses the Alien’s palette of other colors from time to time. Adam has programmed six different color looks on a Martin 2518 controller. True to its name, the main Ghost Bar area is lit in an atmospheric glow from MiniMAC projection (pre-existing fixtures). The highly stylized design and ethereal color scheme make the bar feel as if it's floating over Vegas, a world apart from the chaos below. Installation was by Kelly Communications with lighting supply by Kelly Communications through Martin’s Las Vegas office. 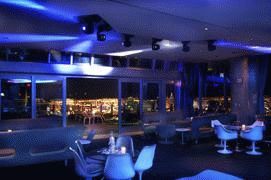 Three venues at the Palms - Ghost Bar, Rain in the Desert, and Skin Pool Lounge, all operated by The Nine Group - boast Martin intelligent lighting systems that have helped make them some of the most popular destinations in Vegas. In addition, the façade of the Palms is illuminated by 98 Martin Exterior 600 automated color changers.